After 38 years of rule, President Mugabe’s rule finally ended. His party Zimbabwe African National Union – Patriotic Front (ZANU-PF) is still in power, this term chaired by President Emmerson Mnangagwa. While campaigning he focused on the idea of Zimbabwe as a country that looks towards the future and uses its agrarian potential. People still remember the joy and relief that went through the country when Mugabe was militarily removed. Cautiously, Zimbabweans hoped for change within the government. In 2018, Emmerson Mnangagwa, the vice president under Mugabe, was elected instead of the opposition candidate Nelson Chamisa. 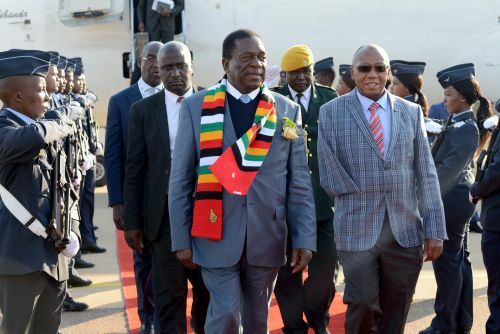 Despite this, small improvements in Zimbabwe’s political system, together with Mugabe’s demise, convinced some experts that change to a democratic regime was possible. Nowadays, new protests have sparked and general unhappiness with the rule of the Zimbabwean president are evident. The high petrol prices and inflation in the Southern African country are causes for this unhappiness. The monthly salary of the average Zimbabwean is 80 US dollars, thus it is almost impossible for them to afford these prices. Another reason that fuelled this anger is the double standard with which this rise is handled. Tourists and embassy employees are being charged old prices. In addition to that, the elite of the country, that forms the party ZANU-PF, has not stopped spending outrageous amounts of money in their private life. The elite, formed by politicians, businessmen and army leaders, replaced Mugabe but did not change their lifestyle. The president took a trip to Russia, Azerbaijan and Switzerland recently, costing 25 million US dollars. Since the beginning of this year, new protests have erupted in the country. On the 14th of January a three day long strike started, protesting the petrol prices. While the protests started peacefully, the reaction of the military was not. More than a thousand people were arrested, several hundred were injured and twelve people have died. The accused, with minors among them, will not get out of jail any time soon. The activist who has led these protests, Evan Mawarire, will be released, however. He called for the labour unions to protest peacefully, but was arrested anyway. The accusation was sedition of the people and trying to overthrow Mnangagwa. Hundreds of lawyers went on to the streets to ask for justice for the people arrested, wounded or killed in previous protests. Ever since independence in 1980 there has not been a moment of true freedom in Zimbabwe. The presidents ruling the country have always used violence to control their population. Mnangagwa is no different, he might even be worse. Mugabe never used the army this openly to shut down protests. Besides the labour unions, different organisations are fighting the current regime. Zimbabwe Divine Destiny is one of those organisations where bishop and human rights activist Ancelimo Magaya actively tries to change his country. He believes that a positive turnover of power will happen at one point. Within the system there is already some uncertainty as well as unrest within the ruling party. Through his organisation he urges people to join the peaceful resistance. “If the church and different social movements keep pressuring the government to change, eventually it will collapse and be forced to negotiate”, he states. Sources: nu.nl, Le Monde, ND, de Volkskrant, the Conversation, the Guardian.